Mark your calendar on 24-March-2012 for Cheti Chand. Cheti Chand is Sindhi New Year which which is also celebrated as Sindhiyat Day to protect and promote Sindhi Language and Culture. This is celebrated all over by Sindhis with lot of functions, food festivals and Jhuloos/Yaatra. Ulhasnagar Mahayatra is famous across the world for its size, money invested and number of people involved. This is worth watching every year. 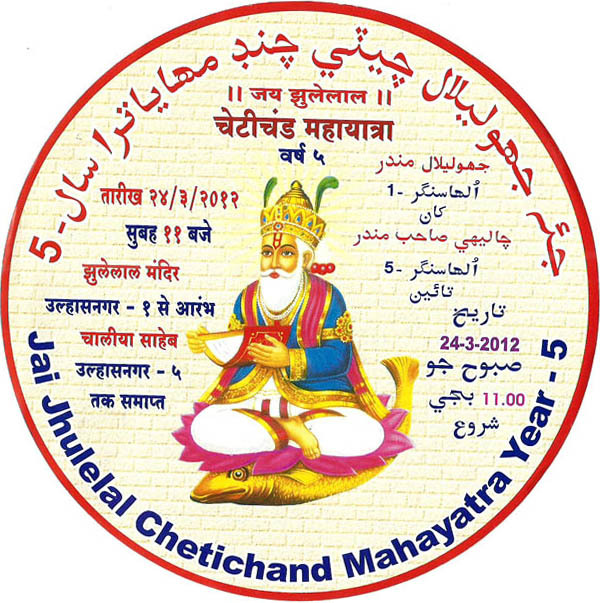 Cheti Chand Mahayatra – 2012 reaches to 5th year and has been growing year by year. Don’t miss Cheti Chand Mahayatra this year which will start from Bhau Parsram Jhulelal Mandir, Ulhasnagar-2 and will go through entire city till Chaliha Sahib Mandir, Ulhasnagar-5. sindhi sab hik aahyun jai julelal beda hi paar. Cheti Chand jyon Lakh Lakh Wadayun !!!!!!! Jai Jhulelal, beda he par!!!! Jay julelal acho sab ghadji kare naye sal ji maja karu.